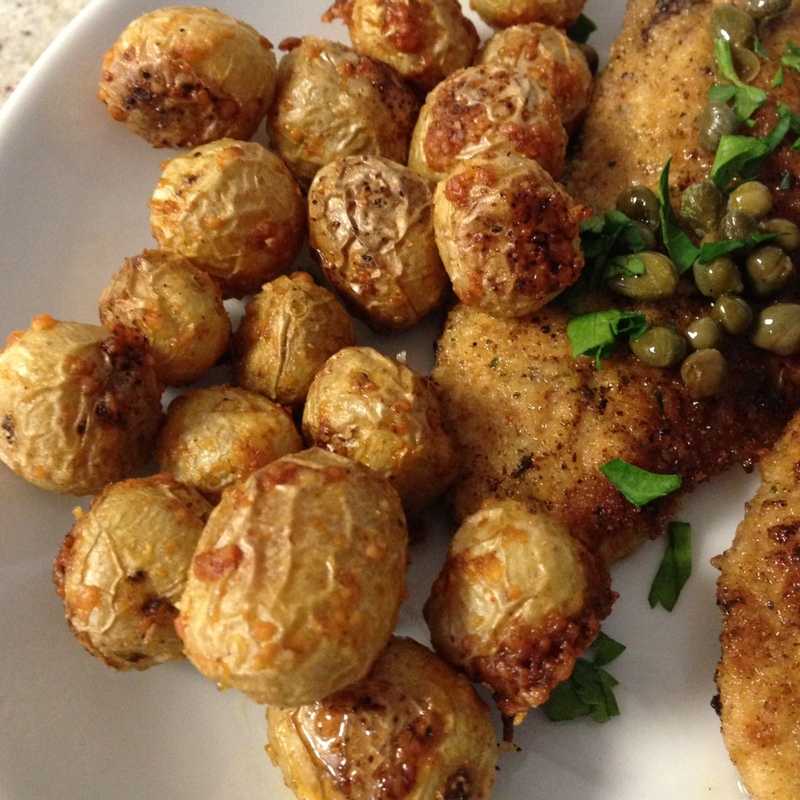 Perhaps you noticed those tiny little potatoes in the bottom photo on my Chicken Piccata post. Whether or not you noticed them, I am here to tell you that they are the easiest, most delicious roasted potatoes I’ve made in recent memory (though, let’s be honest, I’m not sure anything can dethrone Ina’s mustard roasted potatoes). Trader Joe’s sells what they call “Teeny Tiny Potatoes”, and basically, they are… teeny, tiny potatoes. The littlest potatoes you’ve ever seen in your life! In general, they are smaller than a quarter in diameter, which means they don’t need to be fussed with at all in order to roast them – no cutting whatsoever. Just toss them with your desired flavorings, and throw them in the oven! 1.) Preheat your oven to 400°. Line a rimmed baking sheet with foil (non-stick is easier, if you have it). 2.) Throw your potatoes onto the baking sheet, pour the olive oil on top of them, and then dump the salt, smoked paprika, and parmesan onto them. Using your hands, toss everything together until the potatoes are well-coated. The parmesan might clump up and just sit on the baking sheet, but if you just keep tossing it all together with your hands, the cheese will eventually break itself up and coat the potatoes. 3.) Roast for about 30-40 minutes, until the potatoes are cooked through, and the parmesan coating is crispy. Mmm you’re killing me softly this week, Sneaky! These are making their way onto our table tonight! Can’t wait.